I am so pleased with the outcome of our baby girl's floral themed nursery! As an obsessive who loves DIY crafts projects, I had the time of my life painting and decorating this room. I wanted a pretty and girly room design, but I wanted it to transition well and "grow up" with my child so that I could focus on other areas of our home that needed a makeover. Even with other projects needing my attention; I wanted to do something unique and different for my daughter's first room. 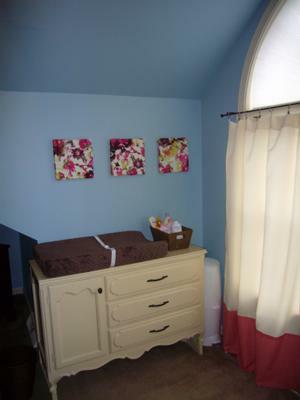 The nursery walls are painted with a lovely blue color paint called "Salt Water" from the Martha Stewart collection. 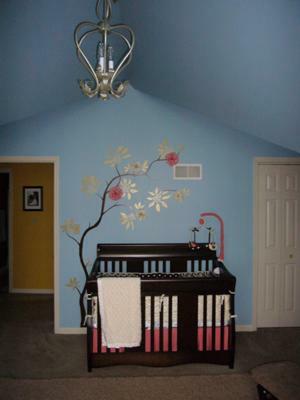 Without question, the tree mural on the wall behind the crib is the centerpiece of our baby girl's floral themed nursery and was created free hand using a simple brown paint for the branches, antique white for the painted flowers and metallic gold for the leaves. After the outline of the tree was complete, I then added large silk peonies with double stick tape to make the mural three dimensional! The mini-chandelier is an Ebay purchase that beautifully reflects the metallic gold leaves of my hand painted wall decorations. 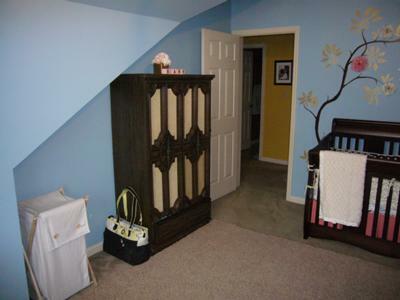 I found both the armoire and the baby's changing table on Craigslist for a very inexpensive price. I sanded the changing table down and re-painted it using the same off-white paint that I used for the painted flowers on our floral themed nursery walls. The crib is a Delta Soho 5 in 1 convertible crib in Chocolate that I bought because it will not only convert from a baby crib to a toddler bed but it will also convert to a day bed and a full sized bed complete with a headboard and footboard. The antique white, pink and brown crib set is also homemeade. I found a baby bedding set that I adored but just couldn't bring myself to pay the crazy price for it, SO I recreated it. After I completed the bedding, I then used the leftover fabric to make the little birds for the baby mobile which was also a recycled purchase from craigslist. I bought the curtain panels on sale at Target and used leftover fabric from the crib skirt to customize them. The colored panels along the bottom gave the space some added color. The decorative floral panels hung above the changing table were made from some fabric I had bought from Joanne Fabrics just because I loved it! I simply cut the fabric into squares and used a spray adhesive to attach it to a piece of foam. I can't wait to put the room to use when our baby girl arrives! Thanks so much for sharing your tutorial with Unique Baby Gear Ideas' visitors, Jolene. You did a fabulous job on all of the painting, sewing and wall decor in her room. The decoration over the baby's crib would be beautiful in an Asian themed nursery inspired by lotus flowers from an oriental garden. I'm sure you are going to be hearing from others who need advice on how to make your own baby bedding and what kind of fabric you used, etc. 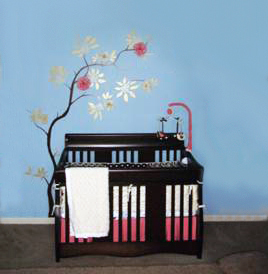 Where did you find the floral wall decorations that are surrounding the crib? I love the mural that you made using silk flowers and wondered if you might offer advice on where to buy them for the best price? The only silk peonies that I have found locally were at Walmart and they were very expensive. Join in and write your own page! It's easy to do. How? Simply click here to return to ASIAN NURSERY PICTURES, BEDDING and DECOR .